Ok, so on a site like this one, there is a tremendous amount of 'code' that I share styled with CSS fonts and using the pre, code, var, tt, samp, and kbd html tags. When using a program like VIM to view/write the code it will be shown with a beautiful font and even excellent colors. So how then can a website like this be configured in such a way that a program called a 'browser' such as Firefox or Chrome would also show the code beautifully? So what is the solution? How to enable beautiful code fonts? Yet another killer free product provided by Google that is basically a font file server, an A+ product! It will serve different versions of a font depending on the user-agent making the request. Brilliant! 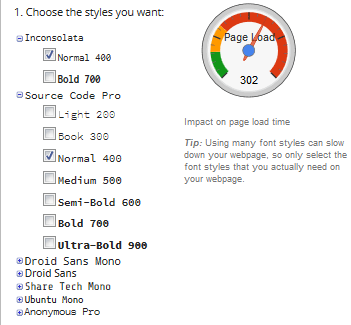 You can use the google webfonts wizard to select and add any fonts. Then grab the code to add them to your site. The webfonts wizard will show you 3 different methods for adding the fonts to your site. I recommend adding it using the <link method the way I am doing it on this site. Change the href= from https:// to // to prevent mixed ssl warnings. Add at the top of your <head> above your other css so that the fonts will be available as soon as possible for the page rendering. Here are the 2 css rules I use. BTW, the Grumpy Wizards sentence is called a pangram or a holalphabetic sentence because it contains all the letters of the alphabet. Of course google developers would be that smart to use a pangram for the wizard. The CSS specification defines the white-space property in 16.6 White space. The white-space property declares how white space inside the element is handled. This value directs user agents to collapse sequences of white space, and break lines as necessary to fill line boxes. This value prevents user agents from collapsing sequences of white space. Lines are only broken at newlines in the source, or at occurrences of "\A" in generated content. This value collapses white space as for 'normal', but suppresses line breaks within text. This value directs user agents to collapse sequences of white space. Lines are broken at newlines in the source, at occurrences of "\A" in generated content, and as necessary to fill line boxes. Takes the same specified value as the property for the element's parent.